We eat a lot of snacks in my family. My two boys have inherited my metabolism and seem to snack continuously throughout the day. Most of their snacks are healthy and consist of nuts, fruit or veggies. However, once a week I bake a treat for an after school snack. When I first eliminated packaged snacks my kids complained. They have had a couple of years to adjust now and my oldest comes home asking what I made today instead of what I bought. To me that is success, he understands that the food in our house comes from the oven not a box. That isn't to say that they don't get a few treats, a box of cereal a week being a main one. There are very few homemade cereals that can actually be made (and taste good) and there is only so much granola anyone can eat. One of my kids favorite snacks is fruit and once every couple of weeks I make them fruit muffins as a treat. Yesterday as an after school snack I tried a new recipe for Blueberry Muffins with Banana Butter from the May 2013 issue of Food and Wine magazine. This recipe has 10 ingredients in the muffins and 4 in the banana butter. The recipe takes a total time of 45 minutes, 20 minutes of which is active and makes 12 muffins. I did make a few changes to the recipe. First I forgot to buy bananas, so the banana butter was out. As many of you know I eat gluten free, but I was making these muffins for my kids so I used bread flour. I never keep whole milk in the house to I used non-fat (the only kind we buy). Fresh blueberries are relatively expensive in my area right now so I used frozen instead. I tossed the blueberries in a small amount of flour before adding to the batter to keep the color from turning the muffins blue. Since I couldn't eat these muffins I had to use my two sons as testers. They must have liked them since they ate the whole batch in less than two days. The muffins cooked up nicely and they smelled great when cooking. My youngest thought they were best with melted butter (he also ate a few with nutella :). It seemed to be a very kid friendly recipe. 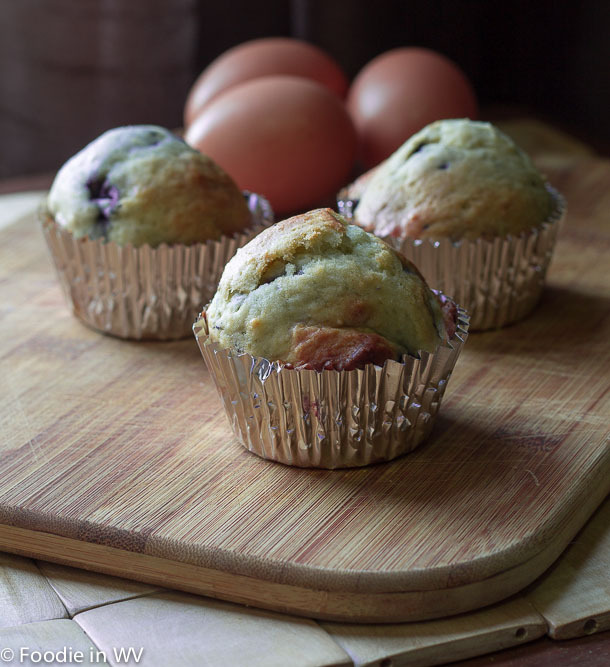 For the recipe go to Blueberry Muffins. I already follow your blog :) Thanks for stopping by! Oooh, you had me at Banana Butter! YUM. I totally want to try these now. My kids really loved them and they smelled great! I love the idea of blueberry muffins. I will have to try these. I have been looking at a lot of recipes as I prepare for Mother's Day. This would be perfect for brunch. May favorite nuffins! I like anything with blueberries in them! I love blueberries also, they are yummy! These look delicious. I know my family will enjoy these. Thanks for sharing. Thanks :) My family really enjoyed them!